The Vampire Diaries: The Fury and Dark Reunion – my books. my life. Spoiler Warning: I can’t really discuss these books without assuming you’ve read at least the ones that came before it. Actually, you better be prepared for spoilers galore. But you can read my post on the first two books here. The Fury is the story of Elena’s new life as a vampire. At first, Elena has a hard time adjusting but soon she is back to her old self and ready to solve the newest mystery in Fells Church: what is this other Power that keeps turning up? With a visit from an old acquaintance, some help from Damon (who’s not quite as evil as we all thought), and some good old-fashioned team work, the characters face-off against this Power. Dark Reunion is the story of what happens after Elena’s death. Stephan is gone, the rest of them are trying to move on. But something Evil shows up once again in Fells Church (at least we get an explanation why evil is drawn there) and it is up to the old gang to take it on. The Fury was a good conclusion to the first two books. We all knew Elena would eventually end up a vampire and now we get to see that play out. We learn some more about what really happened in the past and we get a very dramatic ending. 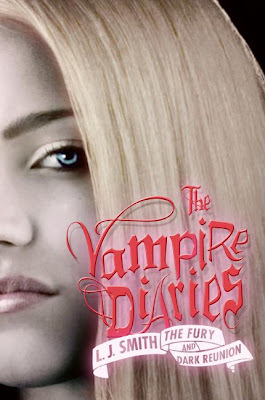 As I understand it, The Fury was supposed to be the final book in the Vampire Diaries trilogy but Smith was persuaded into writing a fourth book (and now two new trilogies are being written). I was rather curious how Dark Reunion would compare since it wouldn’t be told from Elena’s perspective. Instead, Bonnie narrates it with a little narration by the other characters. But I actually think Dark Reunion might be my favorite of the four books. I was actually very interested in what this new Evil was and how they were going to get out of this one. Or maybe it’s that I don’t really like book-Elena that much anyway. All in all, I still don’t love these books. They’re fine. They’re so quick to get through that I don’t mind spending time on them. But after being soiled by the awesomeness of the television series, these just can’t compare. I wonder what I would have thought if I’d read them first or if I’d read them as a teenager. I think I may have enjoyed them more. Instead, I just find myself making comparisons. I am curious as to how the show will incorporate some of these story lines though and I like having a bit of a heads up. I’m sure I will keep reading the rest of the books. Recommended for something quick and easy. But if you must choose, just watch the show. And on that note, here is a promo for Season 2 which premieres on September 9. Can’t wait! I really don’t think I would have liked them much at all if I had watched the show first or if I had read them for the first time as an adult. Maybe I’ll try to the Secret Circle books. I haven’t seen the show… but still felt pretty meh about the books. And if you want to spare yourself anguish and pain – do NOT read the new trilogy. Really, the first books were OK, the new ones are so, so, so painful to read. Really? I thought they might be better. Maybe I’ll pass then. You should check out the show. I’m kind of in love with it. Well… I’ve heard a few others agree too. I hate to turn you off of them, but I did find them terrible in comparison and wasn’t a huge fan of the first ones! I will have to check out the show though! Interesting review, Michelle! Maybe I will ask you for a recommendation. The vampire series that I know of are the ones by Stephanie Meyer, The Vampire Diaries, Vampire Academy series (by Richelle Mead) and Charlaine Harris’ novels. Which one do you think is the best? I’ve heard very good things about the Vampire Academy series but I haven’t read them so that would probably be my recommendation. I’ve heard that the Charlaine Harris novels are very entertaining. I enjoyed Twilight when I read it but now I have negative feelings toward it because of its over-saturation. I’d probably not recommend the Vampire Diaries. Thanks Michelle! I will take your advice when I am in the mood for vampire novels. If you do get to read the Vampire Academy series, I would love to hear your thoughts on it. I’m still only halfway through the first TVD book, I put it down a few months ago and didn’t pick it back up. Still, the TV show redeems any failings of the novels. The sheer yumminess of both Salvatore brothers makes it well worth watching! I can’t wait for the new season! I’ve read the first book and was really disappointed. I didn’t like the story nor the writing of the author but I have to say I’m curious to see what the TV show look like.